Bingo Extra | Receive £40 Welcome Bonus Today! 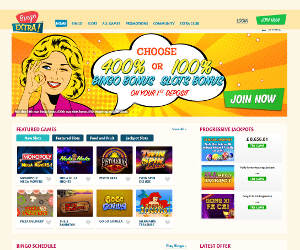 Bingo Extra officially went live as a brand new bingo site in the beginning of 2015. The site takes players on a journey into the good old days with a fabulous 50s style theme. The interface has a fresh and clean design, and is very easy to navigate. Players can also collect exciting bonuses when they join Bingo Extra! Bingo Extra is bursting with extra bonuses and promotions. On their first deposit of £10, they can choose between two exciting Welcome Bonus options, from a 400% Bingo Bonus, or a 100% Bingo Bonus Slots Bonus on your 1st deposit! They can also collect a 100% bingo bonus on their 2nd deposit and a 150% bingo bonus on their 3rd deposit. An incredible selection of bingo games. In addition to classic 90-ball bingo and traditional 75-ball bingo, there are also 5 line bingo games. There’s an exciting £10,000 jackpot to win in the £10k Slider 5 line bingo game! The Bingo Lotto is a thrilling Progressive Jackpot game that starts at £5,000 and keeps on growing! The player that triggers the win is not the only winner though- everyone in the room gets a share! The winner takes home 80% and the room shares 20%. Players can also enjoy a large variety of slots, scratch cards, and table and card games. Bingo Extra takes players on a 50’s ride with Grease: Danny & Sandy slots, classic fruit slot machines, and more!